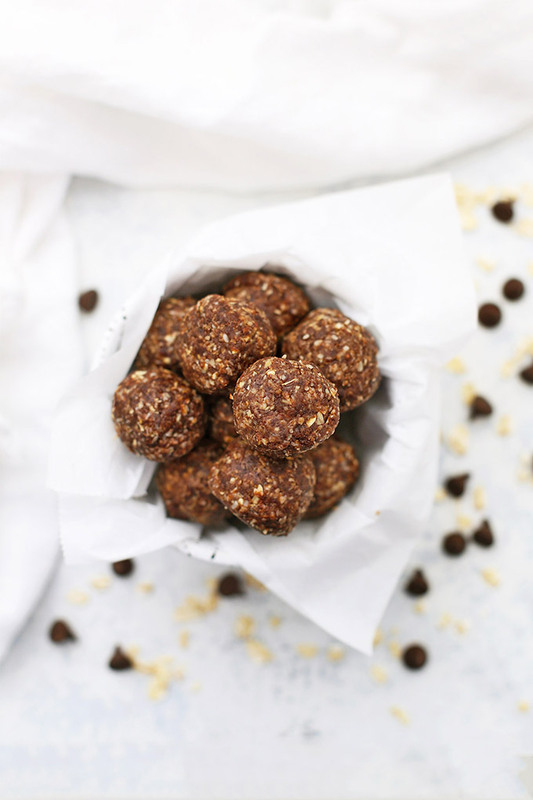 No Bake Cookie Energy Bites – The perfect snack when you’re craving something sweet. 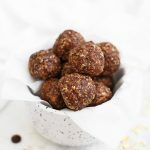 These chocolate peanut butter energy bites are gluten free, vegan and taste just like a cookie! He’s growing a TON this summer and, despite eating REALLY big meals, is super hungry all day long. 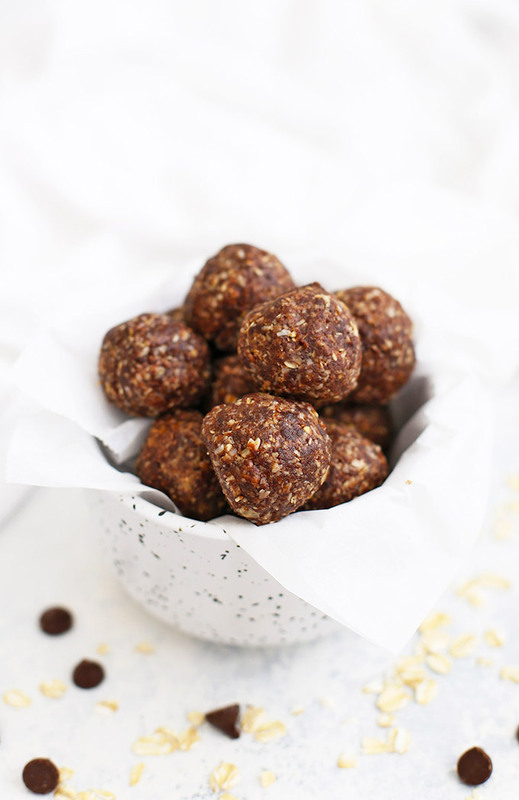 We’ve gotten back in the habit of keeping a stash of energy bites in the fridge so we always have something easy and ready to offer when it’s snack or mealtime. It’s helped! I can add one of these onto his lunches or snacks when he’s eaten seconds and is still hungry, or I can pull one out if he’s just not going to make it to the next meal. It also helps that these energy bites taste like no bake cookies. For real. 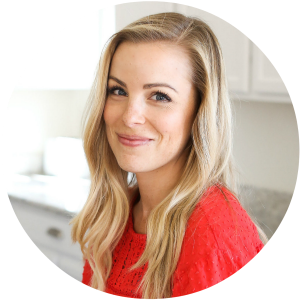 Energy bites have been a great way for me to get more protein and fat in both kids’ diets. They’re just so handy! 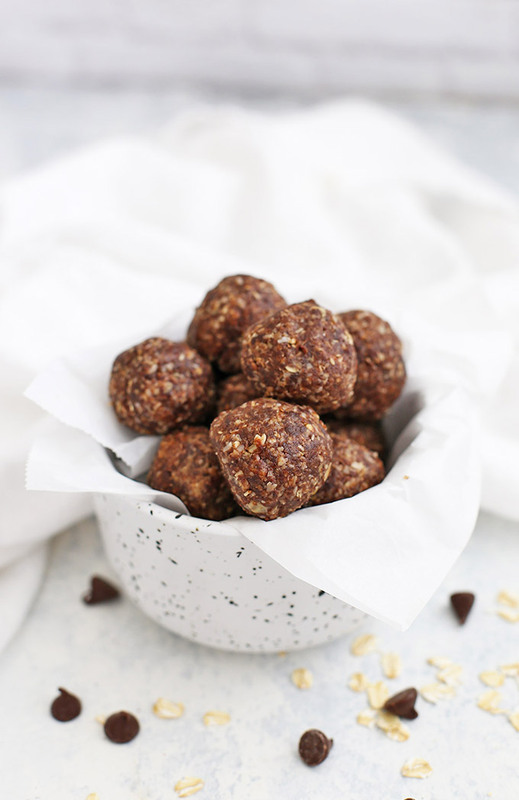 Granted, these no bake cookie energy bites definitely blur the line between sweet and snack, but I love that they’re made from a really simple ingredient list and come together quickly. I love the blend of favors here–the peanut butter chocolate combination is so satisfying! Plus, with oats, flax, and coconut, these get even more filling. It truly feels like you’re eating no bake cookie batter. If you’ve got a peanut allergy or prefer to avoid peanut butter, you can sub something else, like sunflower seed butter, this 7 Nut and Seed blend, almond or cashew butter, etc. They’re flexible and easy that way! Don’t have a food processor? You can mix these up in a large bowl with a spatula. You may find you need to add a little more oats or coconut to keep the mixture from being too wet this way. You want to be able to scoop and roll them into balls easily without the mixture completely coating your hands. Natural peanut butter – I use natural peanut butter (just peanuts and salt–no sugar or oils added), and have found that different brands vary in consistency. Some are quite runny, others aren’t. You may find you need to add a little more peanut butter or a little more syrup or some milk if your peanut butter is thick. Add a layer of flavor. When I have time, I love toasting the coconut before making these. It adds another little layer of flavor that’s so satisfying and delicious! Got texture issues? If the texture of these would bother your kids, you can continue to process them, and add 1 Tbsp of milk or syrup to the mixture to pull the mixture together. They can be VERY smooth when processed this way. My favorite trick: I swear by using a cookie scoop for these. It’s easy to get them all the same size. I scoop them out, then roll them in my hands to smooth them. I use my cookie scoop for everything from meatballs, to energy bites, to measuring muffin batter and more. It’s one of my favorite kitchen tools! Notes on Oats (& a Gluten Free Tip): You can use either old-fashioned or quick-cooking oats for these. We’re gluten free, so we buy certified gluten-free oats. Oats themselves don’t contain wheat gluten, but processing and farming practices often cause cross-contamination. We buy certified gluten free oats and have never had a bad reaction. If that’s not a concern, any kind will do! 1/2 cup unsweetened shredded coconut (I use this kind) – toasted, if you like. In a food processor, combine peanut butter, syrup, cocoa powder, flaxseed, vanilla, and salt. Pulse until mixture comes together and is smooth. Add oats and coconut and pulse until well combined. Mixture will be fairly loose, but should come together when scooped and rolled into balls. 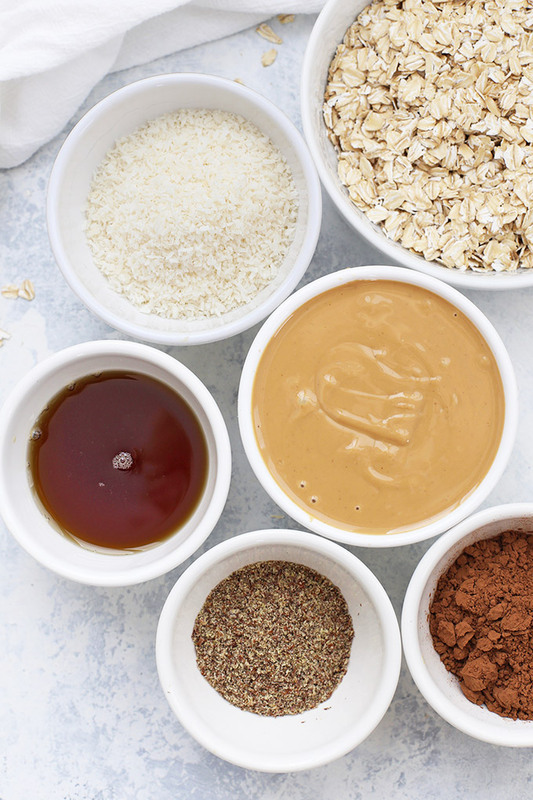 (If your mixture is too dry, you can add a little more peanut butter or syrup, or a Tbsp of milk (plant based or dairy–whichever you use) at a time to help it come together. Alternatively, you can make these in a bowl. Simply stir until all ingredients come together. You may find they’re slightly more wet this way (since the oats don’t get ground down).J ust add a little more coconut and oats until you reach a consistency you like. *Natural peanut butter – I use natural peanut butter (just peanuts and salt–no sugar or oils added), and have found that different brands vary in consistency. Some are quite runny, others aren’t. You may find you need to add a little more peanut butter or a little more syrup or some milk if your peanut butter is thick. Got texture issues? If the texture of these would bother your kids, you can continue to process them, and add 1 Tbsp of milk or syrup at a time to the mixture to pull the mixture together. They can be VERY smooth when processed this way. These look amazing! I’m going to have to make these when we get home from vacation next week! What would you suggest to use if we don’t use honey or maple syrup? Is there any other sticky substitute that isn’t sugar? I haven’t tested anything else with this recipe. You could try some of my others! Most of them use dates instead, like these or these. Weird question: do you think it world work to sub nut pieces (like almonds or chopped peanuts) for the coconut? I just don’t like coconut. That’s not a weird question! I haven’t tested it that way, but I bet it’d work pretty well! I’d make sure to chop them pretty fine before adding them to the mix. If you find that your mixture is more wet (and sticking to your hands instead of rolling out well), I’d just mix in a little more oats to make up the difference. If you give it a try, I’d love to know what you think! Yum, these are fantastic! They really do taste like no-bake cookies! My picky two year old gobbled them up. Thank you! YAY!!! Both my picky eaters LOVE them!